Since the original F.E.A.R. debuted in late 2005, the series has lost some of its impact in terms of delivering a dark and frightening experience and has evolved in new directions. Shifting into the hands of Day 1 Studios for this latest instalment, the team has made multiplayer a focus for the new sequel with the introduction of a robust co-op component. The ability to jump in and out of the campaign with another player in tow, with one person playing as series lead Point Man and the other as his supernaturally reborn brother, Paxton Fettel (with differing special abilities) adds an intriguing twist to the standard F.E.A.R. gameplay. The core technology underpinning the game has also seen a substantial change. Powered by a heavily modified Despair Engine (as utilised in Day One's last game, Fracture) this has resulted in several key enhancements and optimisations which help deliver a more polished experience across a range of platforms. 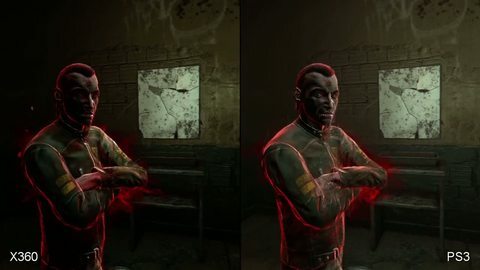 The added use of extra post-processing effects, for example, adds more atmosphere to the scene, while the switch to a deferred shading-based solution allows for a multitude of dynamic light sources to operate without the kind of hit to performance we would expect from a traditional forward renderer. This kind of optimisation is good news, especially for PlayStation 3, which struggled to maintain performance in F.E.A.R. 2: Project Origin. 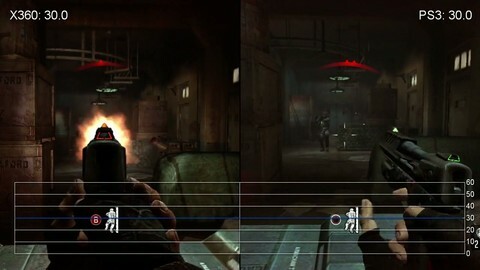 While the actual graphical make-up of the game was pretty close to its Xbox 360 counterpart, the inconsistent frame-rate definitely impacted the gameplay experience. So, with a brand new engine and many tweaks to the core technical make-up of the game, we should, in theory, see a marked improvement in this area on the PS3. As this is the main area where we want to see improvement, we'll kick off with our performance analysis of the new game. As you can see from the video, F.E.A.R. 3 is a lot smoother than its PS3 predecessor. Day 1 has done a decent job in getting the engine operating at a good standard on Sony's system: while the heavy frame-rate drops aren't gone, they are now at least isolated to the larger, more ambitious action sequences. F.E.A.R. 3 is capped at 30FPS and v-sync is mostly maintained, disengaged only when the engine is under real stress (and even then, limited to the top of the screen, where you'd be unlikely to notice it). The 360 game remains the smoother of the two with hardly any frame-rate drops at all. For its part, the PS3 version keeps up quite nicely: a smooth and consistent 30FPS update is commonplace. However, things start to fall apart in the busier scenes and the frame-rate can take a big hit on the Sony system: controller feedback is significantly reduced and the player's "handshake" with the game is noticeably affected. While this isn't anywhere near as bad as the impact in F.E.A.R. 2, it does make some of the key action sequences less enjoyable to play - but thankfully, this is offset by long periods of relative smoothness in between. There are also some smaller dips - such as during the detonation of a grenade, or when longer draw distances are in play - but these are relatively minor blips. Oddly enough, both versions suffer from a visible stutter at times, when the game freezes for a second or so and then starts back up again. This occurs whenever a checkpoint is reached; we expect that the game is loading in new elements for the next scene. Annoyingly, it frequently happens during large fire fights or action scenes. In terms of the visuals, F.E.A.R. 3 looks very close indeed between the two consoles, with just one or two stand-out differences. Here's our head-to-head video, backed up by a hefty comparison gallery. From a visual standpoint, there was little to complain about in F.E.A.R. 2 - bar perhaps the use of some noticeably low resolution artwork, which made the game look a little dated at times. Both versions were native 720p, with the biggest difference being the game looking cleaner on the 360 due to the inclusion of 4x multi-sampling anti-aliasing (MSAA), but the PS3 game was basically on a par in most areas. Silent Scope reboot project collapses.